Renovated in 2008, Geyer Hall was designed to make your retreat at seamless and private as possible. It has WiFi and the ability to tele-conference. 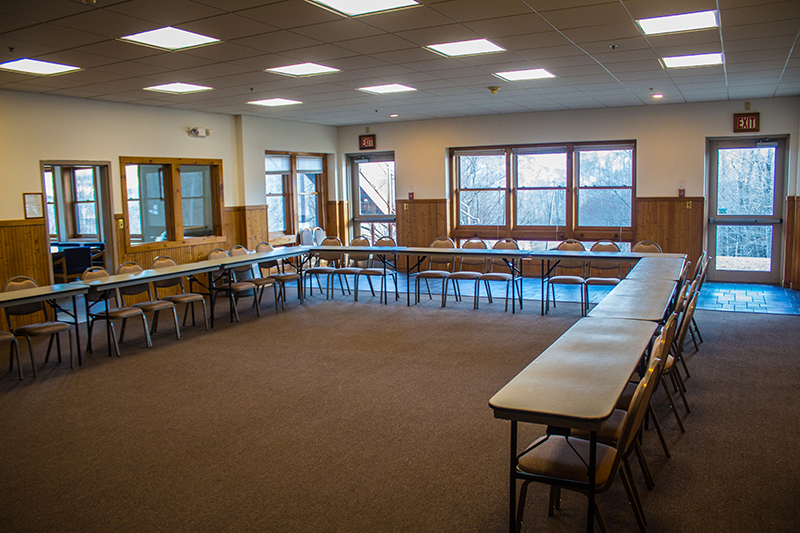 Conveniently located steps away from Lakeview Lodge, our hotel-style accommodation, Geyer has a Verizon wireless router that enables Verizon customers to make cell phone calls, since we do not currently have cell phone service at our location in the Catskills. 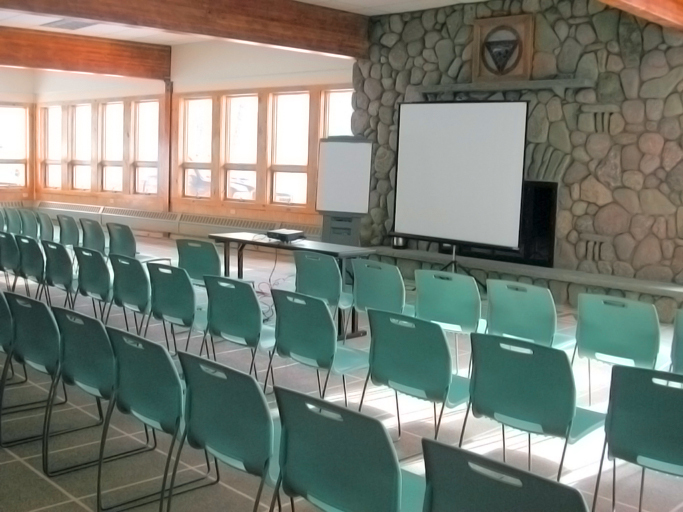 Each of the following rooms either have screens and projectors, or we can provide them upon request. 2 SMALL CLASSROOMS: These rooms seat 20-35 people in chairs at tables. The setup of these rooms is traditionally classroom style, but the tables and chairs can be removed or reconfigured to meet your needs. 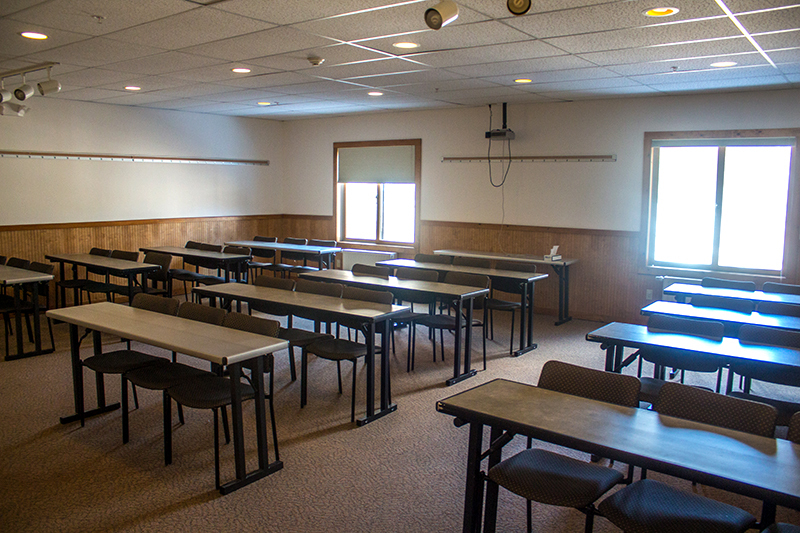 1 LARGE BREAKOUT ROOM: seats 45 people comfortably at tables, in traditional classroom style. The chairs and tables can be rearranged to meet your individual needs. 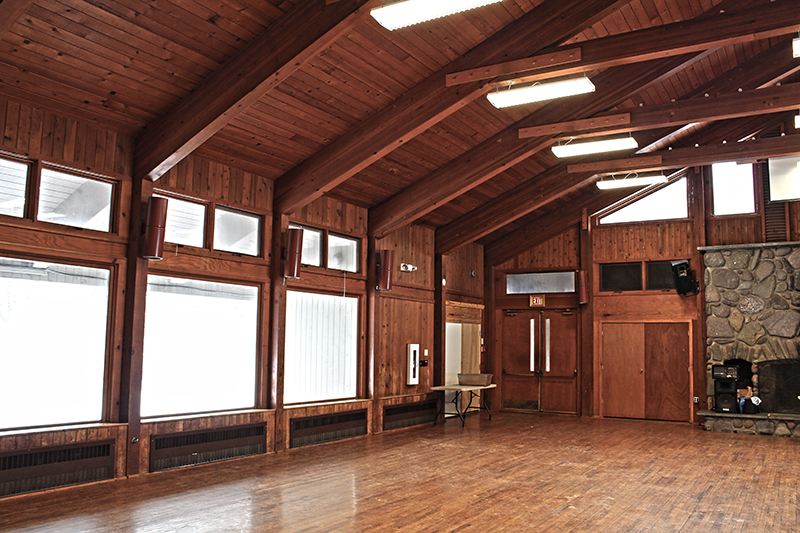 1 LARGE RECREATIONAL ROOM: often used for indoor hockey, this room has a more industrial feel. it can be set up to accommodate small groups of 30-100 in a meeting, yet it has typically been used as a vendor hall or as a recreational/social area. Located at the top of our campus, this unique space provides beautiful views, the warmth of a Tulikivi Fireplace, and the convenience of a large and small meeting space connected together. It can be arranged with tables and chairs to accommodate 35 people, or configured theater style to seat 60 comfortably. Built in 2008, the Wellness Center is a modern facility featuring WiFi and a variety of meeting space accommodations to suit your needs. HUNCOSKY BOARDROOM: This room seats 12 comfortably around a large table, has WiFi and the capacity to host a conference call. With reconfiguration this room can hold 20 people. THEATER: Named for the Community Foundation of NJ, this beautiful space is well equipped to host events from presentation, to performance. It sits 150 people in wooden stadium style seating, provides you with a floor to ceiling mounted screen for video projections, a mounted projector, and surround sound speakers. We have an electric piano available for any who would like music accompaniment. GOTTSCHO ROOM: This room can hold up to 60 people theater style and 35 people classroom style at desks all facing one direction. It has wireless internet, conference call capability, and can be set up with a screen and projector. 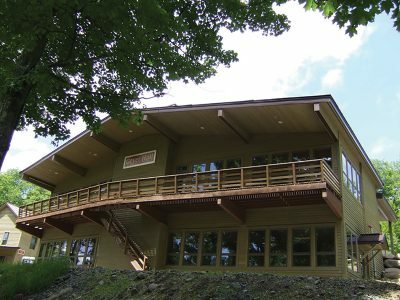 This beautiful and serene building overlooks our Reflection Pond, and Wildcat Mountain. 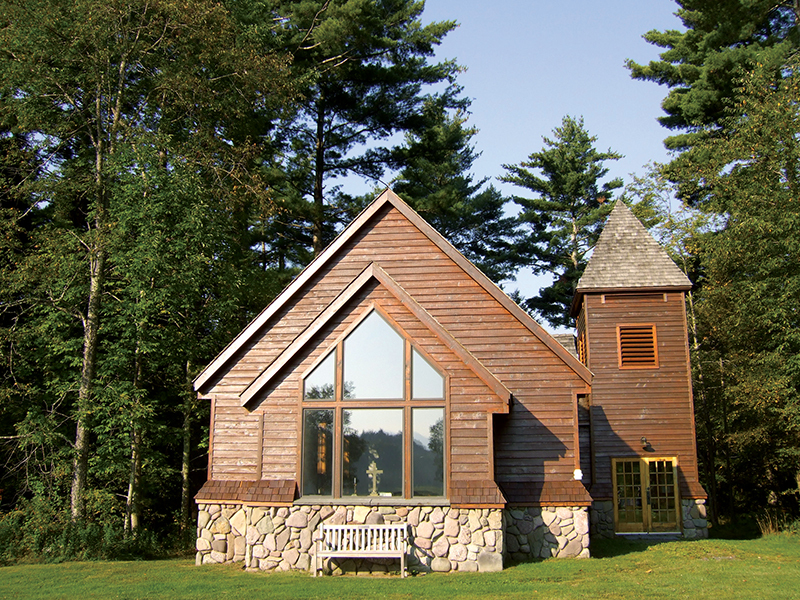 Tucked into the tall pines, it provides an excellent space for reflection, celebration and worship. All are welcome in this space. 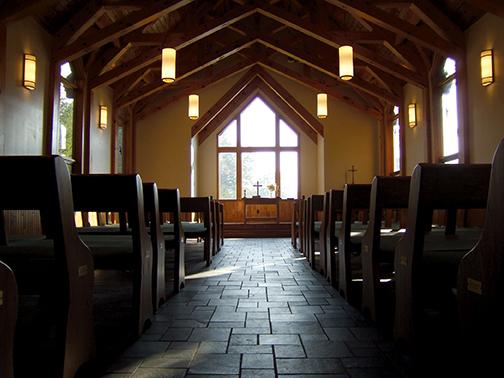 It comfortably seats 150 people in wooden pews, and has an electric organ for musical accompaniment. The acoustics in this building are beautiful, and while not necessary, audio support with speakers and a microphone can easily be set up. 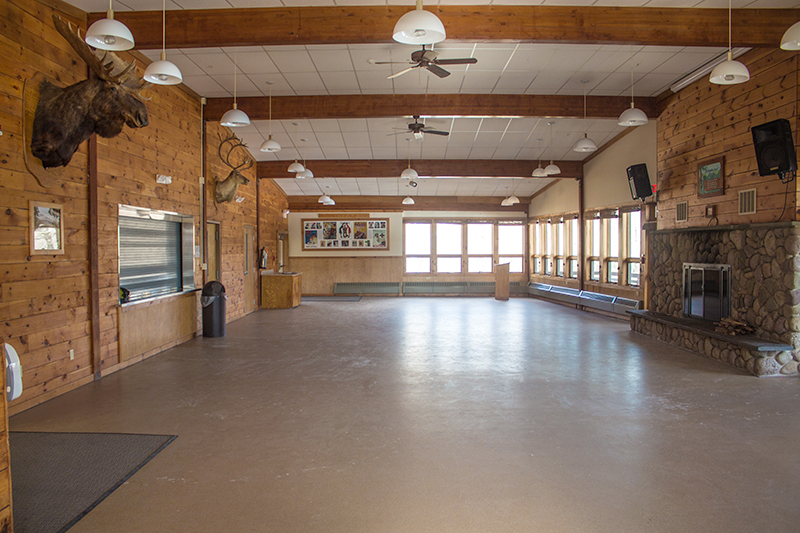 Located in a serene clearing in the woods with amphitheater style, wooden benches and a stone podium as the vocal point, this is a great venue to host a number of different events. This beautiful room boasts hardwood floors and a large fireplace at the front of the room. 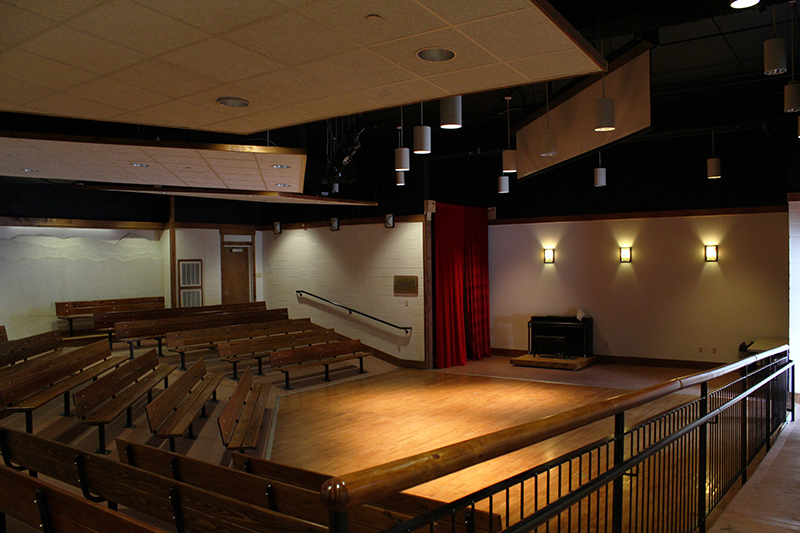 Perfect for presentations and for martial arts or dance rehearsal, this versatile space is a favorite with our groups. It is centrally located within our campus.